In the 1920s, the leading English factories offered "Colonial" versions of their models. They differed from the home market models mainly in increased ground clearance, sometimes allied to high-level exhaust. Such machines gradually evolved into the first "trials" bikes, exclusively intended for off-road use. In the 1950s, new categories of off-road competition began to bud: there were scrambles and motocross bikes intended for racing on closed circuits, enduro machines intended for a combination of race and rally, and trials bikes in the modern sense of the word for tests of machine management and control in which speed played no part. 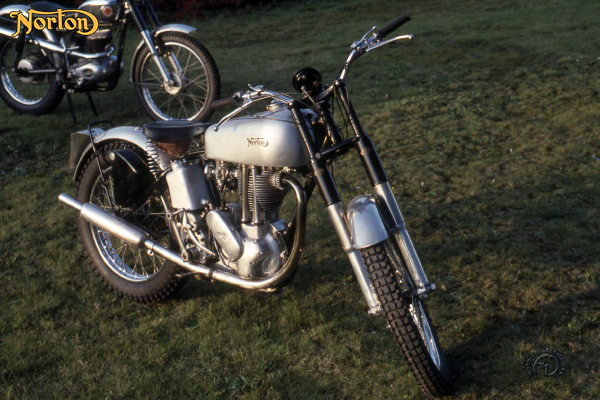 Norton continued to offer trials versions of its sports roadster but, in 1948, launched its first dedicated off-road bike - the Model T. Though only a few of its 350cc variant were built, the 500 quickly tasted success. The works team included a rider who would soon become a household word for speed - Geoff Duke. The 500T used the bottom end of the ES2, onto which were grafted a light- alloy cylinder and head: a slightly higher compression ratio, 6.0: 1, gave maximum torque low down. The frame was a lightened version of that used on the wartime I6H.